Read the article ‘Making sense of documentary photography’ by James Curtis. Curtis contextualises the work of the FSA photographers within a tradition of early twentieth century social documentary photography and touches on the issue of the FSA photographers’ methods and intentions. What is your view on this? Is there any sense in which the FSA photographers exploited their subjects? Rothstein’s assignment to Gee’s Bend to photograph a community descended from slaves now living in the former plantation deliberately panders to racist tendencies that suggest the people photographed are living in primitive squalor, despite evidence to suggest this is not the case. In ‘Negroes, descendants of former slaves of the Pettway Plantation. They are living under primitive conditions on the plantation. Gees Bend, Alabama’ (1937) not only does the extended caption lead the viewer to a particular reading of the situation but the content also seems to suggest a throwback to African tribal society. The subtext of the photograph is that the sole man featured is the father of the many children in the picture and the women are his wives, in fact, he is a community elder with his extended family. The fact that the community Rothstein photographed had been receiving federal aid for two years at the time the pictures were taken is not addressed as this would not fit with the desired narrative. The people who were most important as an audience for FSA photographs were white and middle class, as these were the people it was most important to influence in order to continue with the New Deal programme. That the people photographed are presented as ‘Other’ has sinister undertones – especially when compared to representation of poor, white families. 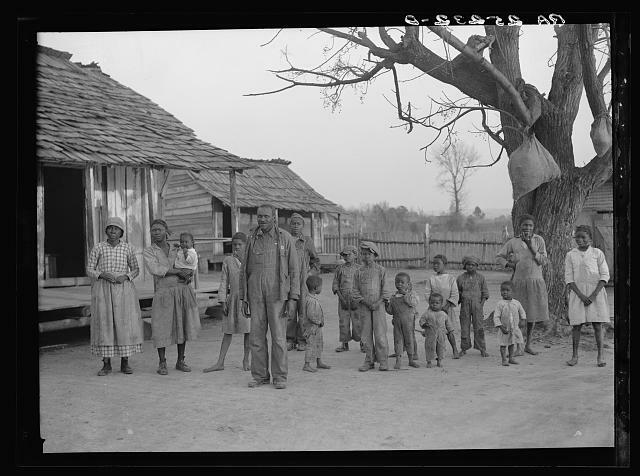 The black families here are presented as a cautionary tale with a subtext that suggests that white Americans could end up in a similarly primitive condition without assistance. 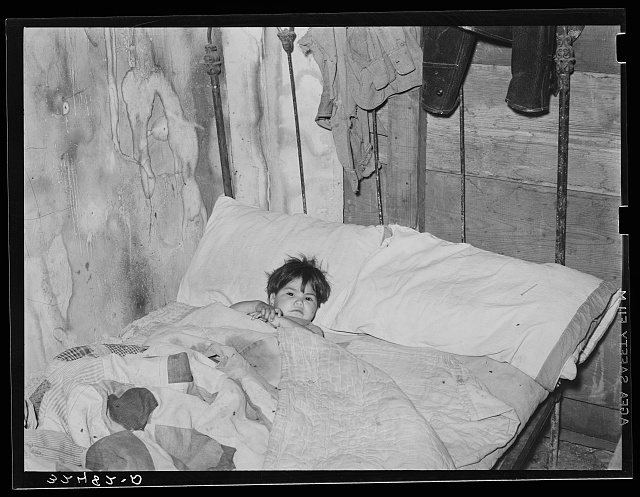 This strategy is also shown in a series of images by Russell Lee of Mexican households which focused on apparent dirty conditions and health hazards that were arguably not present or at least exaggerated. In one image a young boy is shown lying in bed with a caption claiming he is sick, in another image taken at the same time however the boy is shown posing in the doorway suggesting he was fit and well. It appears that Lee, who did not speak Spanish, gained the cooperation of his subjects by photographing at Lent and being invited to record the religious displays that are a traditional part of Mexican observance of Easter. That he chooses to describe these displays as primitive while suggesting the Mexican’s live in dirt, disease and disorder is a severe betrayal of this trust. Whereas Rothstein and Lee can be accused of bending the truth, there is evidence that Evans actively distorted it. Evans was an outspoken objector to the direction of subjects, however, his use of an 8×10 view camera requiring a tripod and long exposures which would mean subjects would need to remain still while the photograph was taken which would clearly suggest an interaction with his subjects. 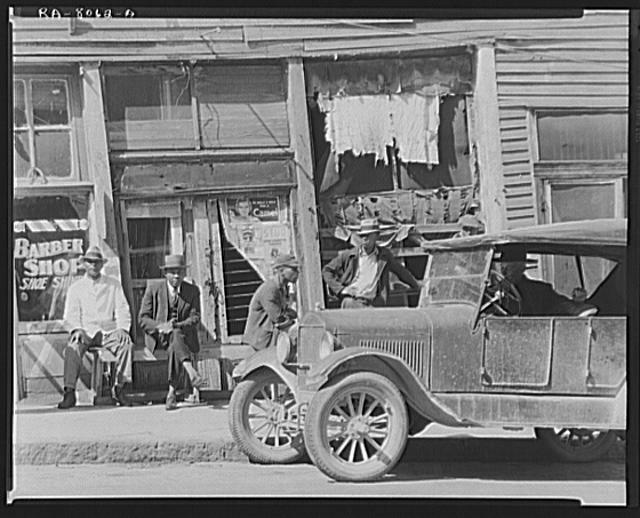 ‘Vicksburg Negroes and shop front, Mississippi’ (1936) is set up as if it is a candid shot despite the technical reasons above meaning it could not have been. Curtis also describes evidence from other images shot on the same day that seems to confirm that Evans directed his subjects. Unlike many of his FSA counterparts who attached extensively captioned their work, the Rothstein example above being a case in point, Evans refused to caption his photographs descriptively. ‘Let us now praise famous men’ (1941) Evans’ collaboration with writer James Agee is a case in point with Agee’s text being presented separately from the photographs, many of which carry no caption at all. Ironically, Agee’s writing also provides further evidence that Evans intervened to make alterations to what he witnessed for aesthetic reasons – much of Agee’s writing is factual description of what was encountered, some of which contradicts what is shown in Evans pictures which suggests items were moved to improve composition. The only issue I have with the work of the FSA is the continued perpetuation of the myth that the project is the pinnacle of documentary realism and the lack of critical scepticism about the ideological basis of the work. The aim of providing aid to those in need is perhaps an explanation to why alterations are excused. Some of the more questionable representations, particularly around race as detailed here, are glossed over or not considered in my reading. The work is interesting and certainly important, however, needs to be viewed as propaganda rather than as historical documents taken on face value and assessed much more critically than the common view asserts.